A surge of fatal shootings in Baltimore, Maryland over Memorial Day weekend has propelled the number of murders so far in May to 35, making it the deadliest month in the city since 1999. In the midst of a wave of violence that has anything but waned in the weeks since riots unfolded across Baltimore, city officials say the tally of homicides so far in 2015 stands at 108 as of Tuesday morning. The Baltimore Police Department told local network WJZ News that 28 people were shot over Memorial Day weekend this year. This included nine fatalities. With the death toll for May now pushing three dozen, officials say the city is currently experiencing its most violent month since 1999. 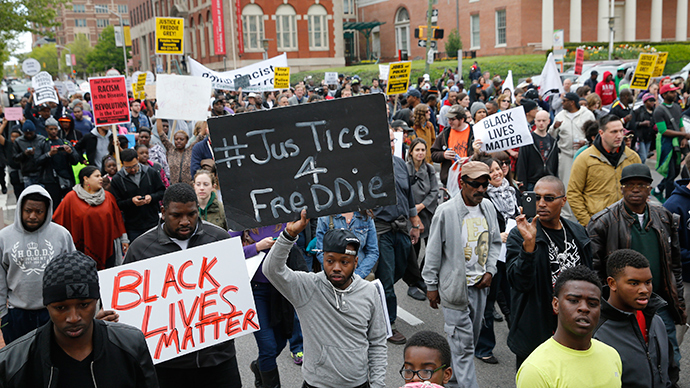 "It's deplorable," City Councilman William "Pete" Welch told the Baltimore Sun. "The shootings and killings are all over the city. I don't think any part of the city is immune to this. I've never seen anything like it." Although Baltimore has hardly been immune to violent crime in years past, the city has found itself in the national spotlight due to the riots that erupted last month following the death of Freddie Gray, a 25-year-old African-American resident who died from injuries sustained while in police custody. Peaceful protests across Baltimore turned violent on the afternoon of Gray’s funeral last month, and officials say upwards of 300 local businesses were destroyed during the unrest. Ahead of the weekend homicides that shattered a long-standing city record, the Sun reported in mid-May that homicides were up nearly 40 percent compared to the same time last year. News reports from Chicago, Illinois indicate that just as many people were fatally shot in the Windy City over Memorial Day weekend as in Baltimore. However, Chicago has a population of around 2.7 million--or around 2.1 million more than Baltimore.